Aims: To compare combination use of repaglinide, metformin and bedtime Neutral Protamine Hagedorn (NPH) insulin with conventional approaches of insulin initiation in patients with Type 2 diabetes (T2DM). Methods: Eighty-two patients with T2DM with suboptimal glycaemic control on oral glucose-lowering agents were randomized to one of three treatment regimens for 4 months. 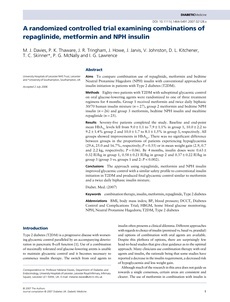 Group 1 received metformin and twice daily biphasic 30/70 human insulin mixture (n = 27), group 2 metformin and bedtime NPH insulin (n = 26) and group 3 metformin, bedtime NPH insulin and mealtime repaglinide (n = 25). Results: Seventy-five patients completed the study. Baseline and end-point mean HbA1c levels fell from 9.0 ± 1.1 to 7.9 ± 1.1% in group 1, 10.0 ± 2.2 to 9.2 ± 1.4% group 2 and 10.0 ± 1.7 to 8.1 ± 1.5% in group 3, respectively. All groups showed improvements in HbA1c. There was no significant difference between groups in the proportions of patients experiencing hypoglycaemia (29.6, 25.0 and 16.7%, respectively; P = 0.55) or in mean weight gain (2.9, 0.7 and 2.2 kg, respectively; P = 0.06). By 4 months, insulin doses were 0.63 ± 0.32 IU/kg in group 1, 0.58 ± 0.21 IU/kg in group 2 and 0.37 ± 0.22 IU/kg in group 3 (group 3 vs. groups 1 and 2: P < 0.002). Conclusions: The approach using repaglinide, metformin and NPH insulin improved glycaemic control with a similar safety profile to conventional insulin initiation in T2DM and produced final glycaemic control similar to metformin and a twice daily biphasic insulin mixture. © 2007 The Authors.